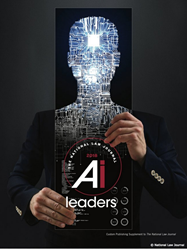 AI firm announces that it was named to the National Law Journal‘s inaugural list of Legal AI Leaders. What the machines can do, lawyers should not. What the machines can do is growing at an impressive pace. We are pleased to be recognized by the National Law Journal along with other Legal AI leaders. Neota Logic announced that it was named to the National Law Journal‘s inaugural list of Legal AI Leaders. The company’s AI-driven platform for intelligent automation of expertise, documents, and business processes was recognized for its ability to scale expertise and enable law firms and their clients, corporate counsel and compliance leaders, to do “more for less." Neota Logic delivers artificial intelligence software that makes doing business easier. Our AI software platform and reasoning engine enable our clients to automate their expertise intelligently at internet scale through applications accessible 24/7, and to improve business decisions while reducing risks and costs. For more information, visit http://www.neotalogic.com.